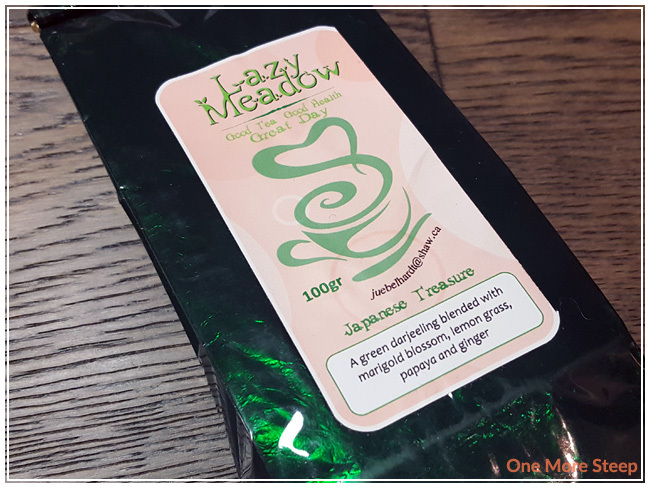 I picked up this bag of tea by Lazy Meadow at the Pacific National Exhibition (PNE) in the summer of 2017. Unfortunately, I’ve been unable to find a website for this tea blender, so I will be doing what I can with the information that I have. 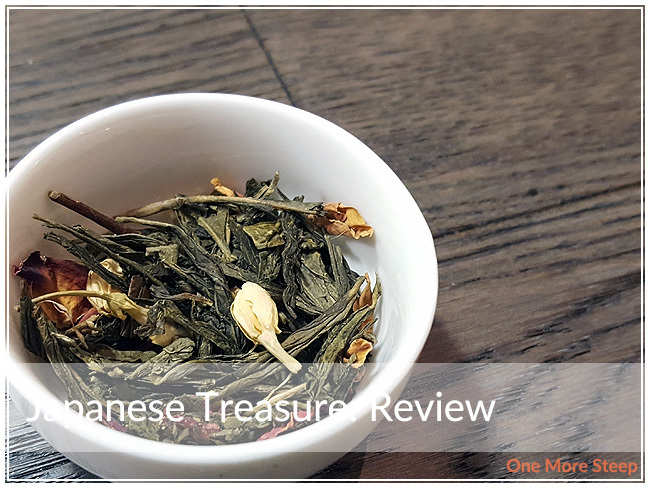 The label states that Japanese Treasure is “a green Darjeeling blended with marigold blossom, lemon grass, papaya, and ginger”. While it does appear to be a green tea, I see jasmine blossoms, rose petals, and some kind of red berry. No lemon grass, papaya, ginger or marigold to be seen. It’s a bit concerning (perhaps a packaging mishap? ), but it does smell good nonetheless so I’ll continue with the review. I’m unable to go back and exchange it, since the PNE only occurs in the last two weeks before school begins. It does smell really good – very floral, sweet, and fruity. I did my initial steep of Japanese Treasure at 79°C (175°F) for 2 minutes. Japanese Treasure steeps to a pale golden yellow. The aroma that wafts up from this tea is primarily that of floral sweetness, with some berry fruit fragrances lingering in the background. When I first sipped this tea, I found that there was a floral sweetness, although the fruity aromas don’t come through very well. 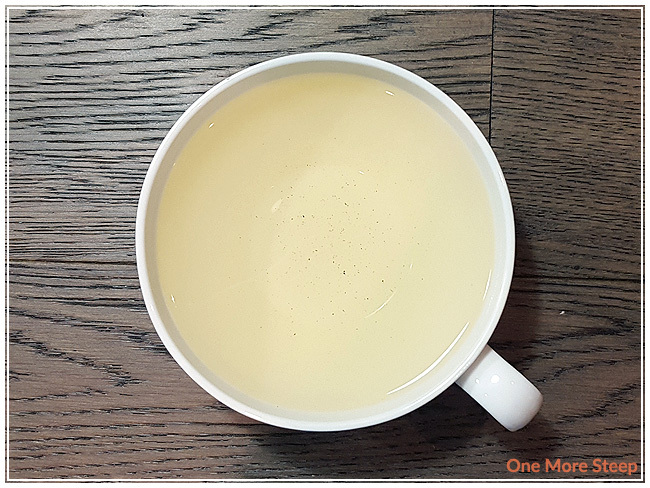 The tea base itself has a bit of a salty vegetal taste to it, which isn’t overwhelming compared to the sweetness from the other ingredients. 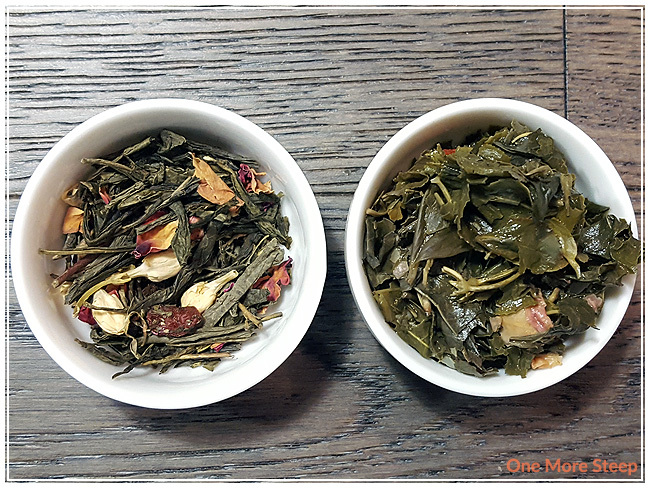 I tried resteeping Japanese Treasure again, but found that the second steep of the same leaves were mostly that of the tea base – salty, vegetal. 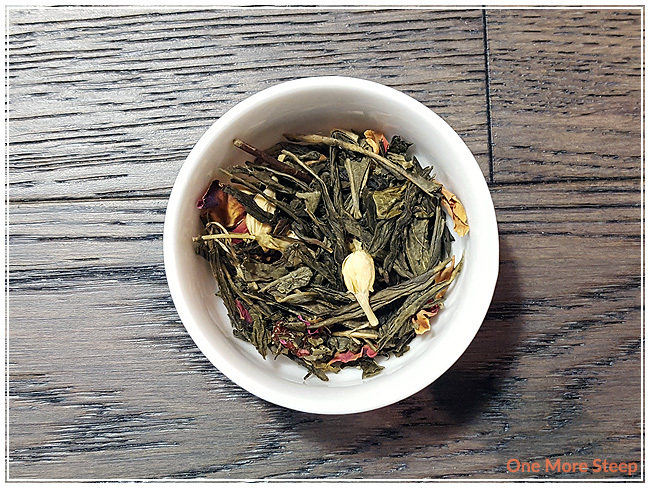 The sweet floral flavours were mostly gone or overwhelmed by the umami flavour of the green tea base. I didn’t like Lazy Meadow’s Japanese Treasure. Aside from the fact that this is probably the wrong tea blend in the packaging (based on the description of the ingredients), this tea had a nice sweetness to it, but I found the saltiness/umami flavours of the green tea base to be a bit distracting from the floral and fruity notes that this tea did have. I did cool this one down to have iced, and found it was marginally improved (it may do better sweetened and iced).